The aviator: J.R.D. 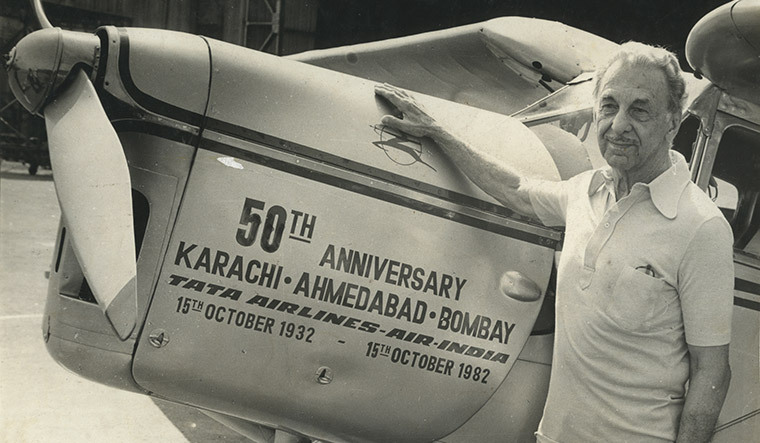 Tata at the 50th anniversary of the 1932 Karachi-Ahmedabad-Bombay flight. T.R. Doongaji hails from Nagpur, the place where Jamsetji Nusserwanji Tata started his first venture, Empress Mills, in 1877. When he was around six years old, Doongaji's cousin would take him to the fire temple where, before entering, he would ask him to touch his head to a bust of “the founder” placed on a pedestal. “I did what he asked me to,” says Doongaji. “Today, I realise that my entire identity is this name.” A J.N. Tata scholar, he spent 52 years (42 in executive capacity) with Tata Group and was managing director in three group companies. Jamsetji set up a provident fund scheme for his employees, the first of its kind in India, and an accident compensation fund. 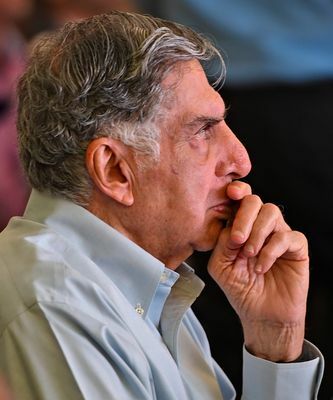 Ratan Tata spearheaded the group’s global pursuits. It was not just the big-bang purchases, but also a well-thought-out expansion leveraging the group’s strengths. A few years ago, some politicians in Nagpur wanted to rename the convocation hall of Nagpur University, the J.N. Tata Hall, to a local leader’s name. A friend from Nagpur called Doongaji, asking if he knew about it. Doongaji dug into the Tata Central Archives to see how the hall was given the name. “We found that the Empress Mills Nagpur had contributed to the funding of the hall, and we had the complete record. We recently won that case in the High Court. I will not allow anybody doing anything with Tata’s name or property,” says the proud Parsi. Jamsetji did not want his employees to work in the squalid conditions that he had seen in Lancashire’s cotton mills. So, at Empress Mills, he ensured proper ventilation and had an apparatus installed for humidifying air. Sprinklers were installed to reduce damage by accidental fires. He also set up a provident fund scheme, the first of its kind in India, and an accident compensation fund. When Jamsetji returned to Bombay, he had made enough money and he turned his attention to purchasing property. Soon, he became one of the wealthiest men in the country. He then began investing in the industrial future of India and drew up plans for many ambitious projects. 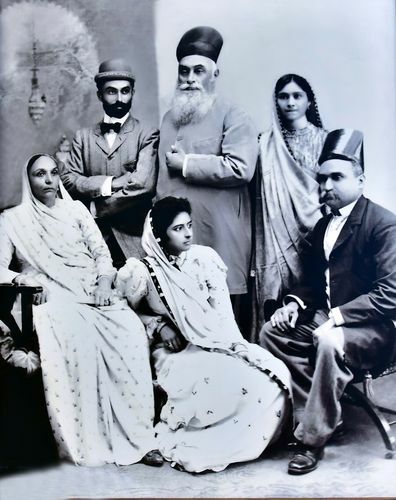 The first family: (Standing from left) Jamsetji Tata’s younger son Ratan, Jamsetji and Ratan’s wife; (sitting from left) Jamsetji’s wife Hirabai, Dorabji’s wife Meherbai and Dorabji. During a visit to the US, at the behest of industrialist George Westinghouse, Jamsetji saw the hydroelectric project at the Niagara Falls. Jamsetji had been planning a hydroelectric project in India and the visit firmed up the decision. 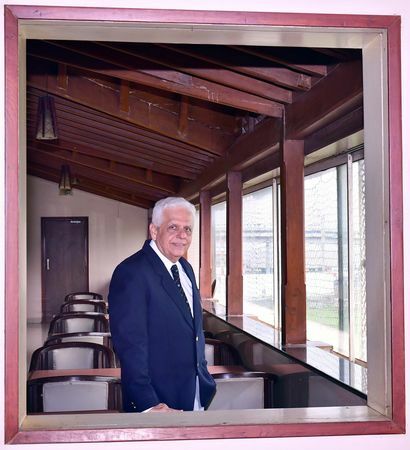 In the Lonavala and Khandala areas of the Western Ghats, which gets one of the heaviest rainfalls in the world and has the right kind of soil, valleys and slopes, he began the work for the Tata Hydroelectric Supply Company. Gigantic pipes forced water to the foot of the mountain at Khopoli, where at the power house, it would be converted into electrical energy. This project turned out be a game-changer, as it provided electricity to the growing city of Bombay. Tata Hydroelectric Supply Company was registered as a public concern on November 7, 1910, and it commissioned the project on February 11, 1915, when Lord Willingdon, the governor of Bombay, inaugurated it. “Today, the major chunk of our power is being supplied to industries, hospitals and residences,” says Rajesh G. Naik, head of operations and maintenance, Tata Power. The total capacity of the plant is 447mw. A big attraction at the project is the 14-acre garden in Lonavala. Jamsetji had a keen interest in gardens, and he brought home plants and seeds from all over the world. When the steel plant at Jamshedpur was being constructed, he wrote a detailed letter to his son, Dorabji, on the fast-growing variety of trees that he wanted him to plant on the site. Said Vivek Vishwasrao, head of biodiversity at Tata Power: “We fall in the northern part of the Western Ghats which is a major bio-diversity hotspot. Some of the species of plants, animals and birds found here are not found anywhere in the world.” Similarly, the beautiful Tata Baug, built in 1891 on 22 acres in Navsari, is maintained by Dr Rohinton Avari, who has a doctoral degree in landscape horticulture. Jamsetji was an “omnivorous reader”, and a fan of Dickens and Thackeray. “He was fond of driving, a good judge of horseflesh, and duly proud of his well-bred Arabs, English Hackneys or Hungarians, and of his smart turnout. At times he enjoyed sailing and boating, and entertaining his friends at picnic parties,” writes Frank Harris in his book Jamsetji Nusserwanji Tata: A Chronicle of His Life. When it comes to 'firsts', however, Jehangir Ratanji Dadabhoy Tata’s achievements stand out. From obtaining India’s first pilot's licence to starting the first cancer hospital in the country, J.R.D. Tata sowed the seeds for a better India. His father, R.D. Tata, was a nephew of Jamsetji's mother, and his mother, Suzanne Briere, a French citizen. He was born in Paris and spent his childhood in France. After his father's death, he succeeded him to become a director of Tata Sons at the age of 22. J.R.D. became Tata Sons chairman in 1938, at the age of 34. The group had 14 companies then. When he stepped down in 1991, there were 95. But his contributions went well beyond Tata Group and its businesses. For instance, he helped Homi Bhabha set up India’s atomic energy programme. Then he helped Homi Bhabha’s brother Jamshed Bhabha set up the National Centre for Performing Arts (NCPA) in Mumbai. Ratan Naval Tata, who took over from J.R.D. in 1991, had an entirely different task at hand. “Liberalisation suddenly happened when Ratan Tata took over, and Tata holding in Tata Steel was just four per cent. Ratan had the task of protecting it. So, again, consolidation had to happen. He actually insulated us from becoming sitting ducks for takeovers. It was a big task, and he has achieved that,” says Doongaji. Tata Chemicals' strategy was to link the lowest-cost production centre in the world with the most attractive market through the best supply chain. Today, Tata Chemicals’ biggest operation is in Wyoming, US. “It is two and a half million tonnes of naturally mined soda ash. It is a brilliant acquisition which has played out very well for the company; it has been profitable from day one and continues to pay us dividends,” says Mukundan. 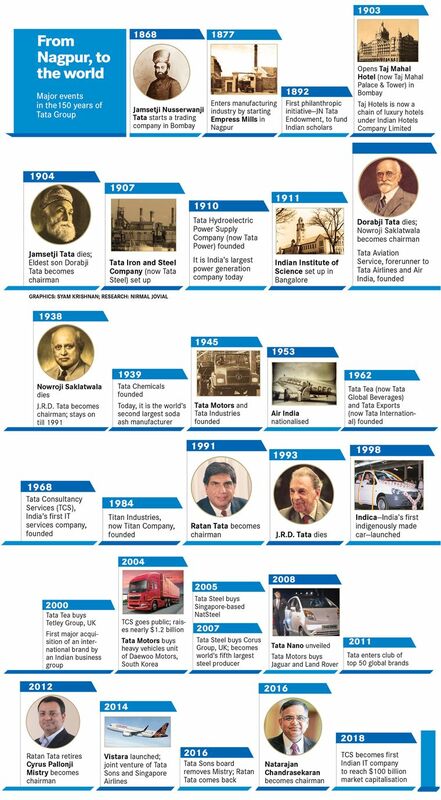 Tata's future, however, is expected to be less dependent on the traditional businesses; but even the future businesses will be dependent on the Tata brand. “In the aerospace industry, credibility, quality and dependability are extremely crucial, and there is very strong resistance to move from one supplier to another because these things are critical,” says Banmali Agrawala, president (infrastructure, defence and aerospace), about how it got to do business with the likes of Boeing, Airbus, Lockheed Martin and Sikorsky. “So, it is not just cost; there is a whole ecosystem of trust that goes with it. I think we have built that over the last seven years, and in many cases, we are now the single-source suppliers to many of the global OEMs.” Recently, for instance, Boeing was very happy that Tata delivered an order for the fuselage for the Apache helicopters ahead of schedule. Agrawala says Ratan Tata is a rockstar. He recalls an incident when they were travelling together and talking about planes. “He knows a lot about planes,” says Agrawala. “He educated me about what kind of fighter aircraft featured in the movie Top Gun. I would ask him, how can you make out and he would say, 'Look at this particular feature, and that’s how you make it out'.” He says Ratan's mild demeanour is not to be mistaken for weakness. “If we are bidding for a project, we have got to win; if we are trying to buy something, we need to end up buying it; and we better not fail,” says Agrawala. Guenter Butschek, who had a long career at Mercedes-Benz and a shorter one at Airbus, visited India in 2015 on Diwali week. He loved it, and concluded that if he got a job offer, he and his wife would be “ready for incredible India”. He got many offers, and it was Tata Motors that attracted his attention. He joined the company in 2016, and quickly realised that it had lost a little bit of track and market share in the past few years, and there was “some work required in order to stop the bleeding, to turn the company around and to get it back to its old glory”. “You cannot continuously bleed as a company while trying to reach this higher purpose as far as community is concerned,” he says.